Mission community unveils “Arab Liberation Mural” celebrating the lives of five Arab leaders who fought against racism and all forms of oppression. 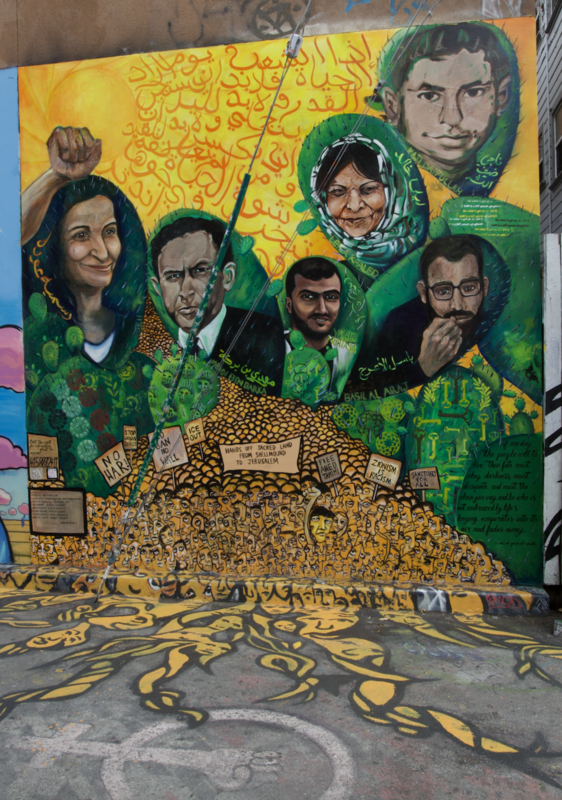 Arab Resource and Organizing Center (AROC) and Art Forces announce a new mural in the Mission’s historic Clarion Alley Mural Project (CAMP) entitled “Arab Liberation Mural” that celebrates and honors the lives of five Arab leaders: Rasmea Odeh, Mehdi Ben Barka, Naji Diafullah, Leila Khaled and Basel Al Araj. Created in collaboration with AROC’s youth program, AYO, and local and international artists, the mural manifests and expresses the resilience and resistance of the Bay Area community to attacks on freedom and liberties of Arab, Muslim, people of color, immigrants and refugees. The people were chosen for the mural because of their exemplary bravery and courage in speaking truth to power. Rasmea Odeh (1947- ) , a Palestinian woman leader and former political prisoner who has spent her life empowering women in Palestine, Jordan and Chicago. For more than 20 years, Rasmea led the Arab Women’s Committee of the Arab American Action Network in Chicago, where she provided urgently needed social services and organized 700 immigrant women to be active members of the Arab community. In 2013, the US government targeted and arrested Rasmea, accusing her of falsifying information on her citizenship application 20 years earlier. This was part of a nationwide sweep against immigrants, Arabs and activists. Rasmea was deported from the US in September 2017. Despite unimaginable circumstances, Rasmea continues to speak out against the unjust attack on her and her community. Mehdi Ben Barka (1920-1966) was a Moroccan activist and educator. He was the first Moroccan to receive a degree in mathematics in an official French school in 1950. He then taught mathematics in a local high school, and at the Royal College. Mehdi got involved in politics, and worked to challenge the French occupation of Morocco. On 22 November 1963, Ben Barka is sentenced to death by the French colonial government for calling upon Moroccan soldiers to refuse to fight with the French against Algeria in the 1963. Ben Barka first went on exile in Algiers, Algeria, where he met with Che Guevara, Amilcar Cabral, and Malcolm X. As the leader of the Tricontinental, Ben Barka was seen as a major figure in the Third World movement, and supported revolutionary, and anti-colonial actions in various states. Just before his death, he was preparing the first Tricontinental Conference scheduled to take place in Havana, Cuba, from 3 -13 January 1966. Nagi Daifullah (1949 - 1973) was a Yemeni migrant to the United States and union organizer with the United Farm Workers. He was a strike captain during the 1973 grape farmers' strike organized by Cesar Chavez. Daifullah spoke Arabic, English, and Spanish, and was integral in not only organizing the Yemeni community but also transcending ethnic and linguistic barriers between workers. At the time, Yemeni farm workers were the latest group (as of 1977) to come to California and be exploited by state growers. An active UFW member, he provided important leadership for workers on strike at Farms near Arvin and Lamont, California. Daifullah was killed in August, 1973 at the age of 24 by Kern County police when one officer beat him in the head with his flashlight and then dragged him so that his head continued hitting the pavement. Over 7,000 people attended Daifullah's funeral. He has been honored across the US including in San Francisco and Orange County and at the the Arab American Museum at Dearborn, Michigan. Daifalluh was one of the most important Arab trade unionists in the United States. Leila Khaled (1944 - ) is a Palestinian woman who lived through the 1948 forced displacement of Palestinians from their homelands. As a toddler, she became an internally displaced refugee. As a young adult, she became an active leader in the struggle against racism and colonialism. She became a leading figure in Third World liberation struggles when she engaged in direct action that raised awareness about the plight of Palestinians on an international platform. As a woman, and and activist, she revolutionized the role of Arab woman in the struggle and came to exemplify the strength and historical role of women in social justice struggles. She is famously quoted in her biography for stating, “They live where we should be living while we float about, exiled. They live in my city because they are Jews and they have power. My people and I live outside because we are Palestinian Arabs without power. But we, the graduates of the desert inns, we shall have power and we shall recover Palestine and make it a human paradise for Arabs and Jews and lovers of freedom." Yasser Murtaja was journalist, 30 years of age, was born and raised in Gaza. He was killed by Israeli forces on April 6th 2018, while covering a protest called the “The Great March of Return” near the Gaza Strip's eastern border.Murtaja was the co-founder of Ain Media, a local TV production company that has done projects, including aerial drone video, for foreign media clients such as the BBC and Al Jazeera English. Murtaja was more than 100 metres from the border, wearing a flak jacket marked “press” and holding his camera when he was shot in an exposed area just below the armpit. At least 7 journalists have been killed in Gaza in May 2018." In 2008, AROC found Arab Youth Organizing (AYO) to empower young people and low-income families in the city. Art Forces uses community public art and technology including murals, websites, social and new media, to inspire critical thinking and action. From the streets of San Francisco Bay Area to Olympia Washington, to refugee camps of Palestine and Lebanon, the projects make visible histories and relationships that have been obliterated and forgotten, making connections to national and global issues of social justice, borders, precarity, migrations and decolonization. Clarion Alley Mural Project (CAMP) is a community, a public space, and a non-profit organization that uses murals and street art as a means for supporting political, economic, and social justice messaging that gives a voice to those who are marginalized and disenfranchised. The Mission of CAMP is to support and produce socially engaged and aesthetically diverse public art as a grassroots community-based, artist-run organization based in San Francisco. CAMP was founded in 1992 by a small collective of artists and activists living in San Francisco’s Mission District as a small community-driven mural project. Clarion Alley itself runs one block between 17th & 18th and Mission and Valencia streets. Over the past 25 years over 300 artists have created more than 700 murals on the alley itself. In addition, CAMP has created dozens of additional off-site projects throughout San Francisco and co-organized and produced an international exchange and residency project with artists and arts organizations from Jogjakarta Indonesia; a second exchange is planned for 2018.